Tannin contained in the plant mucilago from Dutch identity can precipitate proteins mucosal surfaces in the intestine (small intestine), thereby reducing absorption of food (inhibits fat accumulation process). Recommended to consume and multiply the consumption of vegetables and fruits high in fiber. Drink water at least 2.5 liters per day. Reduce fatty foods, many containing flour and sugar. 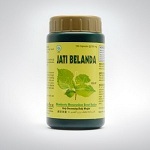 Use of this product should be accompanied by regular exercise, a diet low in calories and low in fat. Direction For Use: Take 2 times a day 2 capsuls. Package: One jar (contains 60 Capsules).